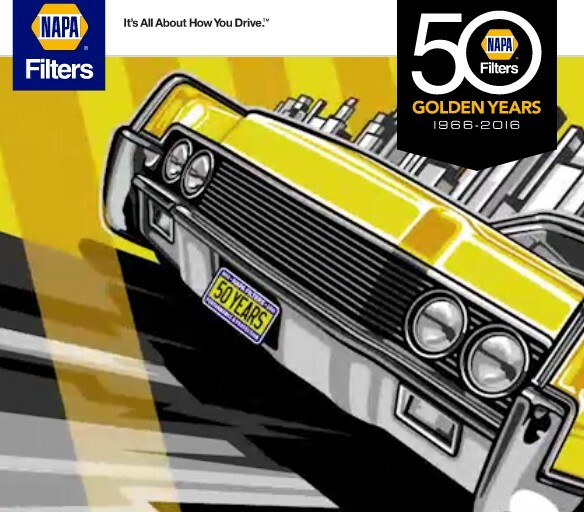 Napa Filters is celebrating their 50th Anniversary and thanking customers for their success by offering them a chance to win a $5000 Gift Card, a Max Grundy tools shop cabinet & more! Every Monday from now until the end of July they'll pick a winner, so be sure to get your weekly entry in! Grand Prize (“Grand Prize”) consists of one $5,000 Gold Gift Card, One Max Grundy Metal Shop Cabinet, multiple NAPA Filters’ 50th Anniversary branded merchandise/swag, two Max Grundy signed NAPA Filters’ 50th Anniversary Golden Years posters, and a select group of NAPAGold™ filters for one (1) selected vehicle to be determined by the selected winner. Approximate value of Grand Prize: $6,000. Five (5) First Prize Winners. Each First Prize (“First Prize) consists of one Max Grundy Metal Shop Cabinet, Multiple NAPA Filter’s 50th Anniversary branded merchandise/swag, two Max Grundy signed NAPA Filters’ 50the Anniversary Golden Years posters and a select group of NAPAGold™ filters for one (1) selected vehicle to be determined by the selected winner. Approximate value of each First Prize: $1,000. Ten (10) Second Prize Winners. Each Second Prize (Second Prize) consists of two (2) Max Grundy signed NAPA Filters’ 50th Anniversary Golden Years posters. Approximate value of each Second Prize: $150. This Sweepstakes ends on 07/31/16 and you can ENTER WEEKLY to win.